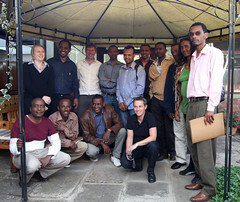 From May 9-11, the NBDC Strategies Project (N2) hosted a Baseline Analysis Workshop in Addis Ababa. This was a chance for NBDC researchers (ILRI, ODI, IWMI) to meet with national collaborators (Oromiya Agricultural Research Institute, Amhara Regional Agricultural Research Institute, Wollega University, Bahir Dar University, Ambo University and Ethiopian Institute of Agricultural Research at Holetta) to reflect on the data collected during the baselining exercise on Planning, Implementation, Innovation and Livelihoods issues surrounding rainwater management. The research plans had been developed at a previous Orientation workshop that was followed by a period of field work during which research teams had collected data from a range of local actors in Diga and Fogera. This workshop was now a chance to reflect on some of the preliminary findings. The teams are now busy conducting more in-depth analysis and this will lead to preparation of draft baseline reports in due course. As we embark on the NBDC project on Integrated Rainwater Management Strategies – Technologies, Institutions and Polices, one of our early activities will be to undertake a baseline survey to understand what is currently going on. This project seeks change in the way in which rainwater management strategies are planned and implemented. We are also looking at ways of spurring local innovation through the use of innovation platforms. We hope this will lead to a more joined up approach to rainwater management that will connect different landscape elements such as livestock, crops and trees. We also look for better connections between technologies and the human factors surrounding them. But before we look at ways of bringing about change, we need to know how things are currently done. This is where our baseline survey comes in. Back in November 2010, we held a workshop with a range of national partners to develop a survey tool to assess planning, implementation and innovation aspects of rainwater management. This led to a series of checklists for various key informants and focus groups (see related blog post). We are now about to go to the field to conduct the survey and our national partners are ready to go. We plan around 20 days field work at each site – our research partners will be accompanied by scientists from the NBDC team. Following collection of qualitative field data we plan a further analysis workshop with national partners to help us synthesize the findings. Alemayehu Belay will be co-ordinating this effort with backstopping from Katherine Snyder and Eva Ludi, both of whom plan to go to the field. Alan Duncan and Josie Tucker will keep a watching brief from their bases. Between 8 and 12 November 2010, we organized a training workshop for national researchers on ‘research methods to build understanding of the planning and implementation of rainwater management strategies’ in Ethiopia. After the meeting, we talked about the workshop with Alan Duncan (ILRI), Josephine Tucker (ODI) and Eva Ludi (ODI). The workshop was part of the ‘Nile 2’ project that focuses on technologies, institutions and policies and integrated rainwater management.